View cart “Out Of The Game: Meet & Mingle for 17 to 30 guests” has been added to your cart. This is a great choice for a small baseball mystery party. 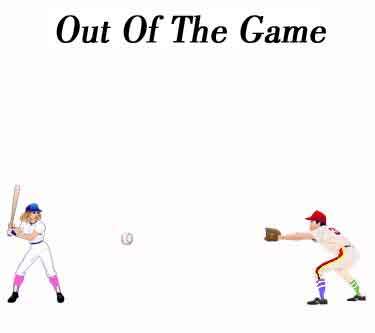 A great game for a baseball party or anytime! It is 1944. “The Boston Odd Sox” were playing “The Chicago Cheeky Chicks”. Petticoat Peterson has made a sudden departure from the field. Murder versions are also available. Sometimes embarrassing things are deliberately left out of the history books. They are covered over and forgotten. The truth is that the 1919 World Series wasn't the only black mark in baseball history – there was a far worse event in 1944. At the tail end of the war, good baseball players were in short supply as they were all overseas doing their duty for their country as part of the war effort. So, as some of you may know, women baseball players were enlisted to fill the gap. What you might not know is that there was still one male baseball team and they played against the women's teams. They were the Boston Odd Sox. The team was comprised of baseball players who couldn't do their military service for various (mainly physical) reasons. The Odd Sox were competing against the Chicago Cheeky Chicks. The Odd Sox needed to win this game in order to reach the finals. The Chicago Cheeky Chicks were the worst team in the League having not won a single game. But there were rumors afloat that the Odd Sox were under control of some powerful gambling entities and that they were going to throw this game. A lot of money was resting on it. Most, but not all of the players were in on it as they stood to make an extra year's wages in just one game. In the first two innings the Cheeky Chicks had performed as admirably bad as usual and the Odd Sox, despite their efforts not to win, were in a slight lead. The problem was that the girls all kept hitting the ball so that it landed on the bases and, thus, it couldn't be easily ignored by the person manning the base. And the girls – all flat-footed and overweight – didn't run very fast so despite ball fumbles and other tactics, the Odd Sox couldn't not get them out without totally revealing to their fans that they were trying to lose the game. Things were getting desperate for the Odd Sox and it was time for them to bat. Although they tried to miss hitting the ball, the pitcher Petticoat Peterson kept pitching so that her ball hit their bat no matter where they moved it to. Then in the last and final innings, Petticoat Peterson made a sudden departure. The game was called off and the police were called in to investigate. Now you might assume the Odd Sox were responsible, but apparently there was some pretty strong in-fighting going on amongst the players in the Cheeky Chicks. And with fans, managers, gamblers and others involved, no one knew for sure who did it. So now let's relive this moment in history and find out who really did it. Peachy Cream: "It's really dangerous. It's so easy to break your nails." Stacey and her husband Joe suggested that we write a mystery about baseball called "Death On The Mound" (now called "Out Of The Game"). And they made various suggestions to us. So we have a lot to be grateful to them for. We finally had our Death On The Mound party and it was so much fun! We served hamburgers, hot dogs, popcorn, peanuts, cracker jacks, and had strawberry shortcake for dessert. Mouldy Cheese brought a cheese platter with cheese from her "parent's shop" and Slammit Suzie brought candy from her "parent's factory". This theme was perfect for us since we and many of our friends are baseball fans. Our guests really enjoyed the story line and had so much fun becoming their character. Thanks for writing this wonderful murder, we thoroughly enjoyed ourselves! I also enjoyed working with you on this project! We look forward to hosting more murders in the future! The night went well - we adapted it to a large group - #170 people!" We had a blast - We had over three hundred parents, grandparents, and staff members in attendance on December 3, 2005. We transformed our cafeteria in a baseball stadium, with locker room and all - We served chilli dogs, nachos, and apple pie - on each table we had baseball tablecloths with a hat and a glove filled with peanuts, popcorn, crackerjacks, chips, and beef jerkey. I wanted to let you know we recently hosted ""Death On The Mound" (now called "Out Of The Game")... It was a really fun theme to do at this time of year, especially. We served hot dogs, popcorn, crackerjack, peanuts, and Big League Chew bubble gum. Our party was very informal.... but, everyone enjoyed themselves! "Hello! I recently had a 40th Birthday party for my husband and we used the "Death On The Mound" (now called "Out Of The Game") party kit. Everyone had a great time! Even those people who are usually a bit reserved really came out of their shell for this one! My son "Doorbell Dunstan" was an absolute riot. Thanks for a great party! PS I purchased the kit, and did a lot of research before I decided on Merri Mysteries." Here are Susan's victim from her "Death On The Mound" (now called "Out Of The Game") party (see photo no. 3 above). "Our party on August 1st – "Death On The Mound" – it was a blast!. Such an awesome party! Also see photos no. 4 and 5 above of Doorbell Dunstan and Shoey Jacobs and Bernie - the party host. Note: The reading levels of each kit (not just "page" as it says below) were determined by copying and pasting the kit (the meet and mingle for 17 to 30), into The Readability Test Tool (see www.read-able.com). He is called "Righty" because he bats with his right hand whereas everyone else on the team is left-handed. He carries the team emblem (a skunk) wherever he goes. He couldn't go into the army because he was flat-footed. He is currently unemployed. He is called "Shoey" because he wears a different pair of shoes to every match. He has more shoes in his cupboard than Imelda Marcos. He couldn't go into the army because he was flat-footed. He works as a waiter at a high-class restaurant. He is cross-eyed. He couldn't go into the army because of this. He can do fantastic, sneaky curve balls and is a great pitcher as long as you point him in the right direction and as long as he chases after the correct one of the balls he sees. He is the sound man for a radio station. He has very big hands and when he's awake, he's a great catcher. He couldn't go into the army because he suffers from a rare disease which makes him fall asleep at odd times. He works as a legal clerk for the county office. He is quick on the mark if he knows what's going on. The problem is that he often doesn't hear the bat hitting the ball so he doesn't know a player is heading his way. He wasn't accepted by the army because he is deaf. He is a university microbiology student. He is a close friend of Sleepy Joe. He doesn't miss much and he's one of the stars of the team. Unfortunately his skills come in equal weight with his arrogance and he is a bit of a pain. He wasn't in on the scam because he is too much of a big mouth. He has a slight hearing impediment and that he is why he wasn't accepted for military service. He is a car salesman. She is a reluctant player and not a particularly good one as a result. She is very proud of her long beautiful nails. Her father is very rich so she doesn't have to work. She works for her parent's cheese factory and that accounts for her smell. She is very keen on the game and a reasonable player. She wears really brightly colored lipstick which she hopes will distract the opposite team and make everyone not notice how bad she is at baseball. She sells makeup at parties but she doesn't have to work as her family are wealthy. She is called "Bouncy Betty" because whenever she hits the ball it bounces a lot. She works at a Diners. She always wears shoes which are a size or two too big for her. These add to her already innate clumsiness. She works in an antique shop. She loves hearing the ball slamming into her mitt when the batters miss the ball. Unfortunately this rarely happens because the pitcher is so bad. Her father owns the candy store she works in.